Mathew Ryan has praised Florin Andone's killer instinct after the striker's goals in Brighton's wins over Huddersfield and Crystal Palace in the last week. 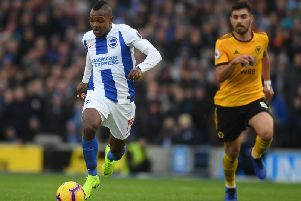 Andone scored the winner at Huddersfield on his first start last weekend and then scored a stunning solo goal as ten-man Albion beat arch rivals Palace on Tuesday. Goalkeeper Ryan praised the impact Andone has had on the squad and added he is a handful for opposition players: "If you're a defender you know he's not going to be far away nipping at your heels. "He leaves it all out on the pitch whether that's training or playing and he can be quite a handful. "As you've seen so far, he's very smart and sharp and has that killer instinct in front of goal. "These last two games he's got two goals which proves he's a massive player for us at the moment. "We all approach training every day like it's a game and we're all very much believers you play how you train. "He's a loud character around the changing room and you definitely know his presence is there when he's in a room. He's got his football to match that aspect of personality he has." Ryan also feels Brighton's recruitment team deserve praise for the players that have come in during recent transfer windows. He said: "It's credit to everyone at the club with the processes they create in going and finding a certain type of player to fit the bill here. "We're a team with no big egos, with no standout characters who put themselves above the team. We just have down to earth, hard-working individuals that are all trying to do the best they can to collectively make a great team. "We work hard day in, day out, and that hard work pays off on the pitch with moments like that (Andone's goal against Palace)."